They’re short handed at the Pure Platinum factory and they need your help in filling all of their orders. Click here to play! See if you can make this extravagant jewelry for a chance to bring in a very handsome payout. The first step in making platinum jewels is to collect the bars of platinum. These bars are worth plenty as three to five of them across an active payline will get you up to 750 times your payline wager. There are also bars of premium platinum. These bars will also bring in a large payout worth up to 750 times your line bet. Melt it all down to make some fantastically beautiful diamond rings. These valuable little symbols will also pick up a top amount of 750 times your line bet. There are also watches, A, K, Q, J, 10, and 9 symbols to be spun across the reels. Keep a close eye out for the Pure Platinum records and Pure Platinum logo. These are special symbols with the first being a scatter that will multiply your total bet and the second will substitute for most other symbols to help you create more winning lines. Create valuable platinum masterpieces in this online slot and you may just end up lining your pockets with plenty of cold, hard cash. 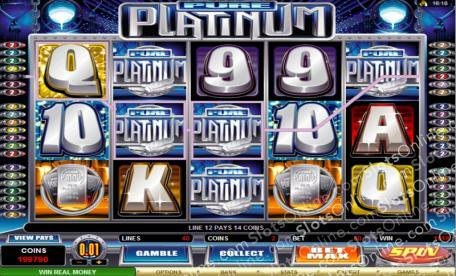 The platinum record is a scatter symbol that will multiply your total bet if you spin two or more anywhere on the board. Three to five of them anywhere will pick up up to 50 free spins with a multiplier. The Pure Platinum logo is a wild symbol that will substitute for most others, excludes scatters, to help you bring in more wins. During free spins it will expand to cover entire reels. It will also payout a maximum of 1000 times your line bet if you spin five of them across an active payline.